The winds of change have been roaring for a while now. In the world outside we are witnessing super-hurricanes, super-typhoons, tornados, arctic blasts, and all kinds of unusual wind events. Internally, many of us are experiencing about the same. Every time I think I can set my sails and move forward with the wind at my back, the wind direction has already changed by the time my rigging is secured. What to do? I mean, after pulling my hair out and throwing a pity party for myself. I got a little nudge from my Inner Wisdom and did a Google search for albatross. Albatrosses are really amazing birds, when they are not hanging around your neck. They are the largest flying birds, some species with wingspans of nearly 12 feet. 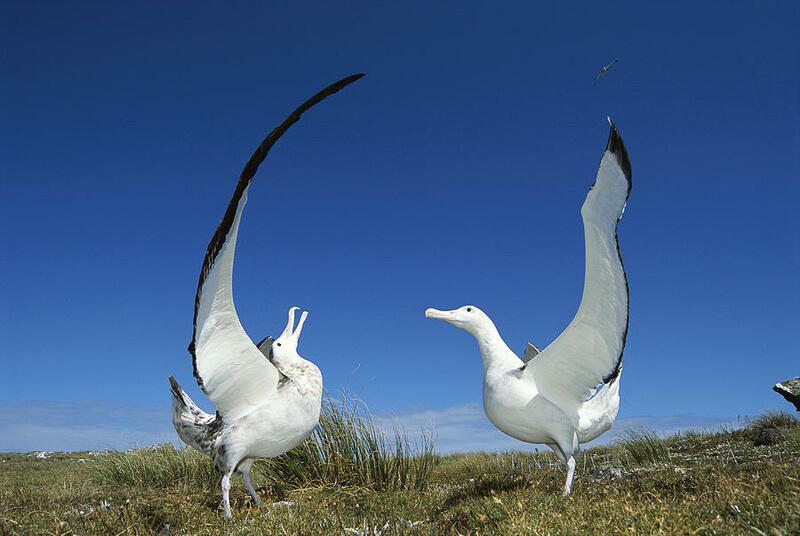 Albatrosses can cover over 1000 kilometers per day without moving a muscle for anything other than course adjustment. They hardly ever flap their wings. Effortlessly, they glide over the waves, using the wind to their advantage. Albatrosses have “tubes” along the sides of their beaks that allow them to accurately measure wind speeds so they can use the gradients to actually gain energy, not spend it in flight. Facing into the wind, they loose speed but gain altitude. Facing downwind, they drop in altitude but gain speed. With strong enough winds, the gain always exceeds the loss. This is called dynamic soaring. Slope soaring is using the rising air mass on the windward side of waves just like the paragliders on Mount Sentinel are using the updrafts on the mountain to gain lift. The bigger the waves are, the more updraft for glide they provide to get across the troughs between the peaks. The glide ration in this maneuver is around 22:1, which means for every meter they drop, they travel forward roughly 22 meters. Albatrosses also live longer than any other bird in the wild. One bird on Midway Island named “Wisdom” was banded as an adult in 1956, and apparently she is still alive today. Someone tell me please, why is the expression “bird brain” an insult? If only we could use the winds of change so efficiently to our advantage! If we could soar across vast inner spaces with the grace and beauty of an albatross, we could ravel in the adventure of being alive in these dramatic storms. We might avoid most of the damage to our health caused by stress, and get fueled instead by the tremendous energy inherent in the changes we are facing. There are at least two ways to get across a chasm. Either you make a run for it and take the leap. Or you get close to the edge, spread your wings, and let the updraft carry you across. Which way you choose depends on nothing more than personal preference and, naturally, anatomy. How is the unfolding of your wings coming along? Namaste, I regard the Albatross within you!